Looking for movie tickets? 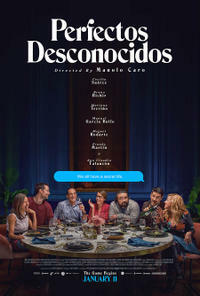 Enter your location to see which movie theaters are playing Perfectos Desconocidos near you. A group of best friends get together to share a dinner when the hostess proposes a game. All guests must lay their cell phones on the table and read aloud all incoming messages and answer all incoming phone calls in front of the entire group.